America's power is in decline, its foreign policy adrift, its allies alienated, its soldiers trapped in a war that even generals regard as unwinnable. What has happened these past eight years is well known. Why it happened continues to puzzle. In Daydream Believers, celebrated Slate columnist Fred Kaplan combines in-depth reporting and razor-sharp analysis to explain just how George W. Bush and his aides got so far off track - and why much of the nation followed. For eight years, Kaplan reminds us, the White House - and many of the nation's podiums and opinion pages -rang out with appealing but deluded claims: that we live in a time like no other and that, therefore, the lessons of history no longer apply; that new technology has transformed warfare; that the world's peoples will be set free, if only America topples their dictators; and that those who dispute such promises do so for partisan reasons. They thought they were visionaries, but they only had visions. And they believed in their daydreams. 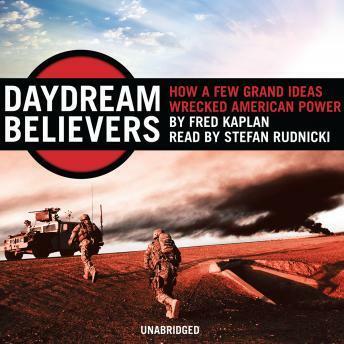 Packed with stunning anecdotes, hidden history, and a level of insight only Fred Kaplan can bring to issues of national security, Daydream Believers tells a story whose understanding is central to getting America back on track and to finding leaders who can improve both the world and America's position in it by seeing the world as it really is.